Enjoy the pleasure of have your own car and driver to discover this beautiful island. 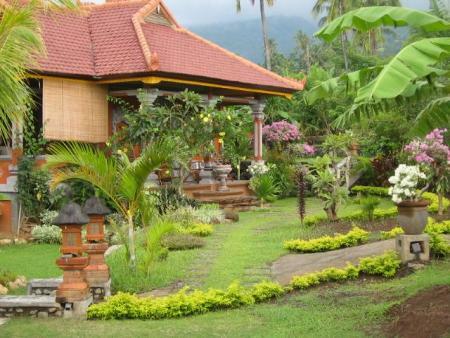 Waterfalls, rafting- and temple tours and the mountains Agung and Batur all easy to visit. Just tell your driver, and your off and away. Next Airport is Denpasar about.150 km away. 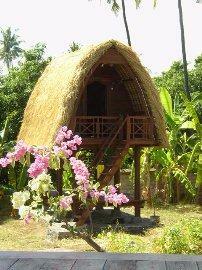 Snorkeling, beach, temples tours, bird park and volcano tours. 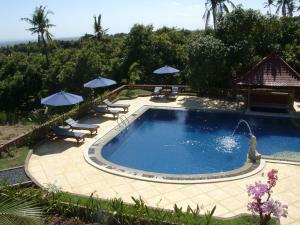 his typical Bali style Villa has two main bedrooms in the main house, there is also 2 elevated small teak thatched roofed houses each can sleep 2, there is a large 12 x 12 mtr pool with pool bar and also a large separate living - eating area which offers splendid views across the tropical garden to the sea, there are two main bathrooms are on the premises with hot and cold running water. Kids to 12 years are free. Incl. transportation from/to the airport, scooter, car, driver, phone, cook .... only gas and Food for cooking extra.